Swift Transportation will increase wages as part of its plan to retain truck drivers. America’s largest trucking firm will put more effort into retaining its drivers in a bid to stem a rising turnover rate that is threatening company profits. 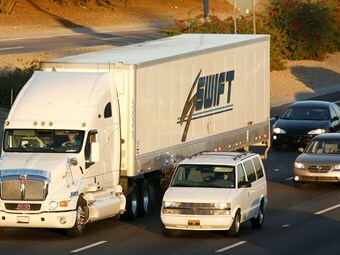 Swift Transportation has blamed driver shortages for constraining its operations and contributing to an almost $10 million drop in its bottom line in the second quarter of 2014. America is currently in the grip of a chronic driver shortage and Swift, which boasts a fleet of more than 16,000 trucks, has been hard hit. "Our driver turnover and unseated truck count were higher than anticipated," Swift says, referring to the three months to the end of June. "After assessing the current and expected environment, we believe the best investment we can make at this time, for all of our stakeholders, is in our drivers." The company says it has a number of initiatives in the pipeline to encourage drivers to remain with it, including paying higher wages. "Our goal is to clear the path for our drivers by helping them overcome challenges, eliminate wait times and take home more money. We believe we can accomplish this through improved productivity and enhanced pay packages," Swift says. "We expect these initiatives will increase our expenses in the second half of the year but will also enable us to improve our unseated truck count and grow." Swift says the lack of drivers affected its ability to fill shifts and prompted it to offload more equipment than it had planned. "As a result, we chose to sell or trade more trucks than originally anticipated, which resulted in an increase in gain on sale of equipment in the quarter," it says. Swift reported a $40.1 million profit for the three months to the end of June, down from $49.8 million at the same time last year. It has noticed a significant decrease in half-year profits, reporting $52.5 million for the six months to the end of June, compared to $80.1 million for the same period last year. America’s peak trucking lobby, the American Trucking Associations (ATA), says there is currently a shortage of about 30,000 to 35,000 drivers. "As the industry starts to haul more because demand goes up, we’ll need to add more drivers – nearly 100,000 annually over the next decade – in order to keep pace," ATA chief economist Bob Costello says. The ATA says the turnover rate for large trucking firms increased to 92 per cent in the first quarter of 2014. The rate was as low as 39 per cent only four years ago. "While high, turnover at large truckload carriers is lower than other years when the driver shortage was as acute," ATA chief economist Bob Costello says. "In 2005, turnover averaged 130 per cent. In 2006, another year with a tight driver market, turnover averaged 117 per cent for this group of carriers." Turnover at small trucking firms was 78 per cent for the quarter, significantly lower than in 2005 and 2006 when turnover averaged 96 per cent and 109 per cent, respectively. Costello has warned the turnover rate could keep rising as improved economic growth and a jump in freight volumes put more pressure on driver shortages.